The deal for Shanghaî Disneyland is not signed yet, but let's say it's on good track. Tokyo Disneyland is going fine with three new attractions coming in a near future - Monsters Inc in april, Mickey's philarmagic in two years and, as Honor Hunter of Blue Sky Disney told us yesterday - Toy Story Mania at Tokyo Disney Sea. 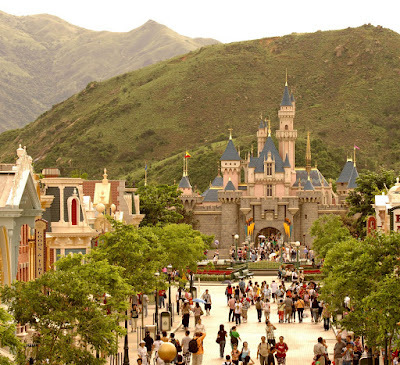 But what will happen to the other Disney theme park in China - i mean: to Hong Kong Disneyland? Well, one month ago Variety announced that "Disney is offering to fund expansion of Hong Kong Disneyland theme park..." "...But plans to develop the site have yet to be approved by Hong Kong's government, which is the park's majority owner, and it may demand changes in the shareholding structure..."
Then, some days later, on Dec 22, Hong Kong Disneyland CEO Kam Min-ho said that "the company will invest HK$4 billion in expanding its park. Details of the expansion plan are expected to be released next year after discussion with the Hong Kong government. The expansion work is expected to be finished within two or three years...As planned, the new facilities will comprise three theme zones with an area of about one third the size of the existing park. Some of the new attractions in the proposed extension will be exclusive to Hong Kong Disneyland, said Bill Ernest, president of Asia Region, Disney Theme Park and Resorts Business Unit." Wow! 4,000,000,000.00 of HK Dollars that makes 515,530,715.13 USD (thanks to the XE.com conversion site!) and that's quite a lot of money! I mean, you can do a lot of good E-Ticket attractions for that price. Or you can have a whole new land. Or both. Or even more, and it's very good news for HKDL as we know the park need an expansion with new attractions. 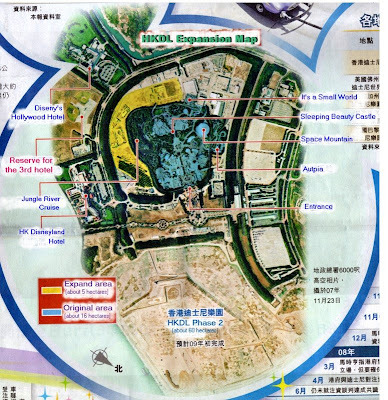 The other good news is in this quote: "Some of the new attractions in the proposed extension will be exclusive to Hong Kong Disneyland". Great. But what kind of attractions exactly? Of course there is this "Pirates of Caribbean" land, a gorgeous concept - even a rendering of it was released in a Disney annual report two years ago. More than a single POTC attraction it is indeed a real Pirates of the Caribbean land which will be build on the land available over the train track. Inside, of course a POTC ride which include a huge "outside" splash at the end, a pirate village which probably include smaller attractions on a pirate theme - why not this shooting gallery with a pirate theme once envisioned for DLP? - not to mention a rumour which keep saying that even a Haunted Mansion will get a "pirate" theming but the latest infos says that this beloved E-ticket - with a whole new storyline - should be build in fact in another land. No need to say that i am one of those who keep praying that this POTC land will exist for real as soon as possible. The only problem is the price. To be frank, i don't know the exact price of it, but i won't be surprised if it was between 230 and 300 M$. And we must remember that you can have TWO Indiana Jones Adventure for the same amount of money! So, let's keep our fingers cross for this POTC land until the official announcement happen eventually later this year. But if there is one land which exist in all other Disney's Magic Kingdom and still missing at HKDL, it's a Frontierland. Not that the imagineers didn't want to build one, but the budget at that time didn't made it possible. Wisely, they kept the room to build one in the future, and the good news is that the time has come for Hong Kong Disneyland to have its own Frontierland with an opening expected in 2010-2011 for the 5th anniversary celebration of HKDL. The two other lands that Mr Kam talked about should open if everything goes fine two years later, in 2013. It won't be as big as the one we have in Paris or even in Anaheim, but it will be a nice little Frontierland and will also be build in the land available on the other side of the HKDL railroad track . Of course, if you say "land" it means "attraction" inside it, and when you think about Frontierland, which attraction is the most "attached" to it? Big Thunder Mountain? Right, except that there won't be any Big Thunder Mountain at HKDL. Instead, HKDL guests will discover a brand new attraction - one of those "exclusive attractions" that Bill Ernest was talking about - called: "Grizzly Mine Show". Yes, a new Mine Train coaster is coming to a Disney theme park. And how will be this Grizzly Mine Show, you ask? 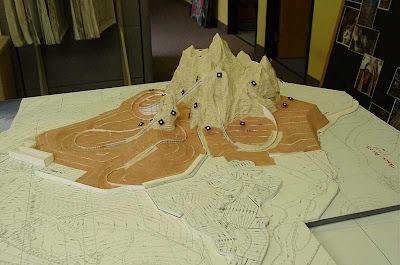 Well, no rendering available yet, but from what i've been told, think about a rock mountain who should look like the Grizzly mountain at DCA - without the sculpted Grizzly head, and for the ride track itself, think about Expedition Everest. It will be more or less a mix of both, although less high than Expedition Everest, but may be as fast as EE can be with tunnels, exterior lift and great scenery, all of this in a "north woods" vegetation theme. In the front of the Grizzly Mine Show mountain, you'll find some typical wooden Frontierland buildings like those you have around an old mine. And when you'll know that part of the WDI team of imagineers who built Grizzly River Run at DCA were asked to work on this new Grizzly Mine Show mountain, you'll understand why the two mountains may have "something in common" when this future HKDL attraction will open. Now, just like in Big Thunder Mountain, the mine train - who will begin its ride by plunging into a mine tunnel - sometime will slow down, whether it will be for a lift or other reasons. In BTM, we can see Audio Animatronics animals or other special effects like the moving rocks. For this new HKDL attraction the imagineers are thinking about something that could make happy those of you dreaming of a revival of Marc Davis legendary project "Western River Expedition". To be perfectly clear, Grizzly Mine Show will NOT be Western River Expedition, but from what i've heard, WDI imagineers are seriously thinking to use as inspiration some of Marc Davis WRE concepts for scenes of the Grizzly Mine Show. May be not WRE scenes with audio-animatronics cowboys, but why not some of the fun scenes where animals were involved...we'll see. By the way, some of you may wonder why they don't build an Expedition Everest at HKDL. After all, Everest is Asia's most famous mountain. I thought about this too and here are the three reasons i found why it would be a really bad idea. First, the cost. Expedition Everest is a huge mountain, and its cost is just as huge. When you want to give to a park a big expansion, you try to keep money to build other rides. Two, the size of it. Although it's beautiful at Animal Kingdom, you must remember that HKDL has already real mountains in the background. The size of expedition Everest mountain won't fit with the real one right behind. And, three: the theme itself. Expedition Everest story line is all about this legendary mountain and the mythical Yeti. And which country do you think about when you hear the words "Everest" and "Yeti"? That's right: TIBET ! And if there is one country that you better avoid to have an attraction story line all about in a chinese theme park, it's really Tibet! No good! Specially when you want to keep good relations with chinese officials for a future theme park in Shanghaî! For all these reasons Expedition Everest would have been a no-no, and the choice of a grizzly instead of a yeti is pretty wise. Also, and more simply, a yeti would of course not fit in a Frontierland theming! But a roaring Audio-Animatronic Grizzly can be just as great as a yeti. There is no doubt that a well-themed and fast mine coaster will be successful and also a great help in the financial rescue of the park. Yesterday, Andrew Kam, HKDL resort’s managing director said in an interview that "a range of exciting products, including fast rides, would be put into the Hong Kong resort as half of the park’s attendants were young adults". Well, Hong Kong Disneyland young adults who love fast rides can be happy, as the Grizzly Mine coaster is coming to the rescue anytime soon. Good news for HKDL ! Hope its really a exciting fast ride! Hoping they leave a few original pieces of California Adventure alone! Yes, Mark, i hope it too, it could be a very exciting "dinosaurs" coaster - or may be a kind of "Journey to the center of the earth" coaster...we'll see! I am wondering is Pirateland still alive? I want to add two more infos: First, it seems that the pirate land was retaken into discussion last month - which is good news - and, two, the new HKDL Frontierland may also have a raft ride. Still trying to find what this raft ride could be. This is fantastic news - I had read all the articles about the cash infusion last fall but I wasn't sure when we'd be hearing any details. It seems like the approval process with the HK government has been grinding on for ages. 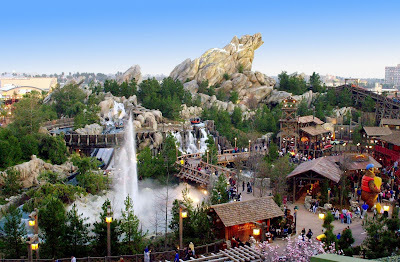 I had always heard that the HK Frontierland would have a "north woods" theme and this would seem to fit right in. I actually thought they might try to work in the old "Geyser Mountain" idea, but this sounds pretty great as it is. A combination of BTMRR & Everest, with a threatening grizzly... it's a great idea. And having scenes from Western River Expedition... well that's fantastic. I'm not sure about the "raft ride" you mention - I hope it's not another cheesy off-the-shelf deal like GRR or Kali Rapids at DAK. It probably is, though - although they could integrate it into the new mountain and coaster and that would work well. That would actually be just like Thunder Mesa was intended - a coaster and a water flume attraction interweaved. Nice. It's good to hear that the pirate area is back in vogue again - I was surprised when it was said they had gone off the idea. The park needs a POTC, and the idea of merging POTC and Splash Mountain's flume was a good one. Is Mansion still supposed to be Adventureland/voodoo themed? Because that was a nice idea as well. Wonder what the third area they have planned is - Toontown? Probably Pixarville if recent history is any indication. Thanks so much Alain - this is great info. wow I wish that one day, my family and I travel to Hong Kong to see this awesome adventure. The idea of a Pirates of the Caribbean solely themed area is a dream come true, as a pirates of the caribbean fan. This sounds absolutley fantastic and I wish they would build it, it would be one of the greatest additions to DIsneyland ever and act as the rival for the Wizarding World of Harry Potter, kind of like its own Jurassic Park area like at the Universal parks abroad. The concept art for this land, featuring skull rock, Tortuga, a port area, pirate ships looks like an adventurer's dream come true. I can't tell how excited I am to hear about this. Plus the news of a possible Indiana Jones Advnture ride, could life get any better than that? This is aadventurer's dreamland, a place where we can all be kids forever. The Indiana Jones Adventure and Pirates of the Caribbean are two of my most favorite attractions ever created. Someone also mentioned a Journey to the Center of the Earth ride in the near future possible at Tokyo Disneyland. That sounds even more exciting since I saw the concept art and inside photos of the ride at Tokyo Disney Sea, and it looks like another one of the best attractions ever created. Plus the addition of something like Expedition Everest, my most favorite themed roller coaster in the world other than Revenge of the Mummy. Expedition Everest is now the cutting edge roller coaster to add to any adventure park on Disney's terms. I loved the ride at Disney's Animal Kingdom. I'd love to see all these rides in one place, it would be a dream come true. The combination of Indiana Jones and Pirates of the Caribbean is one of the best ideas ever for a Disney park I've ever heard. Two Indian Jones attractions is even better since Disneyland Paris has another one possibly planned with their roller coaster Temple of Peril. I'd love to see something like the Wild, Wild, Wild, West stunt show from Universal Studios fame brought back, either to Disney in a future Frontierland expansion or at another Universal park. Thanks for the update, it's like a future Imagineer's dream to hear this, and I hope they build it in the near future because it would probably be the best Disney park ever conceived and built. Will there EVER be a Toontown in HKDL? I hope so! It was canceled but I'm not sure why. Anyone know why? P.S I have been to HKDL and it was amazing! Just questioning if eBay makes it possible for you to sell [url=http://www.ticketchoice.com.au]concert tickets[/url] on the net? Do you know if you can find any restrictions depending on what country you are in? My parents have just called me and asked if i could "get rid" of their two tickets to some concert as they wont be able to make it as a result of one more family event. Apart from asking buddies etc, i thought ebay would be an excellent location to market them.